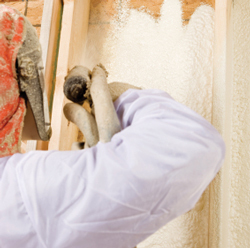 Spray foam insulation plays a major role in improving home energy performance. It’s a versatile weapon in the battle against energy inefficiency because it can do more than "fluffy" insulation materials like fiberglass and cellulose. As it's applied, spray foam expands to fill cracks, gaps and odd-sized spaces. It doesn't just improve insulation value wherever it's applied; it also seals air leaks. That's a major bonus, because air leaks can be responsible for 40% of the energy wasted in a typical house. Spray foam also provides high insulation value --close to R-7 per inch of thickness for some types. High R-value, excellent gap-filling qualities, and effective air sealing capability –no wonder spray foam is in demand to upgrade energy efficiency. But there are different types of spray foam available, and some of the terminology used to describe this high-tech material can be confusing. That’s why it’s helpful to gain a bit of basic knowledge about spray foam before deciding to use it in your house. Here are some details and definitions that can help you make smart decisions about spray foam. 1-part foam for small gap-filling assignments. Two-part spray foam refers to spray foam that's created by mixing two chemical compounds together right at the application nozzle. This is the most common type of spray foam used by insulation contractors. One-part spray foam comes in small pressurized cans and is typically “spot-applied” to fill gaps and cracks. Closed-cell spray foam is cures to form a hard, rigid material that can act as a moisture barrier as well as an air barrier. 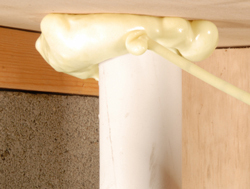 Most two-part spray foam is the closed-cell variety. Open-cell spray foam is applied by mixing two components. It’s lighter and more sponge-like than closed-cell foam, with lower R-value per inch. Unlike closed-cell foam, open-cell foam will absorb moisture rather than forming a moisture barrier. We proudly offer spray foam insulation in Connecticut, including Bridgeport, Hartford, New Haven, and nearby areas such as Danbury, Norwalk, Stamford, Waterbury, New Britain, Bristol, West Hartford. Call 1-888-370-6924 or contact us online to schedule a Free Estimate.